7:00 pm for high school youth. Everything at Emmanuel is centered on the Life, Peace and Hope we have in Jesus Christ! Our service is ancient and brand new! We aren't trying to be historical. We aren't trying to be contemporary and cool. It's just real! The music is played on a variety of instruments. The preaching is centered on the Bible, Christ and Him crucified, and relevant to your life! We gather as the family of God together, singing together, receiving His gifts of forgiveness and eternal life together! Sometimes it's serious and sobering. Sometimes it is joyful and exciting. No matter what, it always flows from the heart of God to us! We have a nursery available for infants and toddlers. Attention occupiers are located near the sanctuary entrance. These are quiet activities to help your child(ren) and you enjoy the worship service. Children's bulletins for children ages 3-6 and 7-12 are available from the ushers. 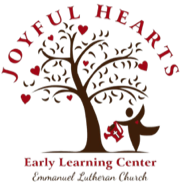 Provide your little ones with the exceptional christian child care and preschool education they deserve when you enroll them in the programs at Joyful Hearts Early Learning Center in Cadillac, Michigan. 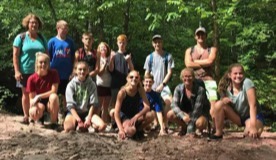 For more information click the link below.